The so-called ROPO (Research Online Purchase Offline) is now common practice to which we have given a name. Having become more a reflex than an after thought, most buyers now go online before making a purchase: 91% of buyers to be exact. Think of it as a digital display window if you want. Web to Store: So what is it? Since the explosion of e-commerce and the subsequent growth in numbers each year, we have also bore witness to the trend of Web to Store. Web to Store provides all the actions needed to send an online customer to (or back to) a physical store. 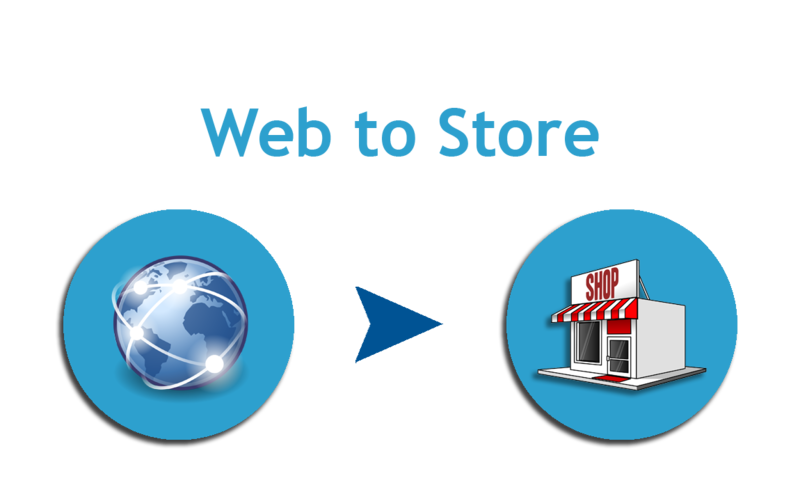 In other words, web to store provides a guideline for pushing your potential customers to shop in your store and not on the web. Why bother? Because, simply put, there are people that are not yet yielding to the ease and flexibility of online trading. There are various reasons that may come in the crosshairs, ranging from those who do not want to wait for delivery or those who prefer to use their tactile and visual senses with the product, to those who fear stolen bank information — not to mention those who prefer the advice of another human being, not an alias, to make the right choice. Ask for them to register first physical contact information (address, phone, etc.) that will allow you to make direct contact with your prospect. Implement a Google Maps or on the Mappy “Contact” page of the site that will allow them to have a live view of your store(s) the location(s). If you own a single store, set up a Google My Business page as an effective and well referenced way to show where you stand. Complete the above two points with a geolocation system, so only stores close to the user will appear, with the time needed to get there and the most direct routes to take. Provide the opportunity to start the purchase online but complete it in-store when picking up the product. So, it is on your part to choose which actions suit you most, depending on your industry. For example, if you offer a service, not a product, the consulting approach is essential. Thus, you should put forward the means to establish contact in order to identify their budgets, and guide the prospects into your offers and do what it takes to precisely meet their needs. This practice of the Web to Store, also known “Click & Collect” if we take the point of view of a user, has its own advantages and disadvantages for e-retailers. Advantage: If your customers (as they have already purchased on your site) come to collect their goods in your shop, you have the opportunity to encourage further timely purchases on site, such as batteries with their new game console, an accessory for their new mobile phone, or even a package of chewing gum discretely placed at check-out. Disadvantage: If your customers come to buy and pick up their products, this means that you have these products, which implies a generally important logistics work and a more or less complex organization. As this requires logistics of a work force, it adds additional expenses: salaries, stock management accountant on balance, deliveries, etc. No matter what, it is restrictive. It is important to know that according to a study by BVA (a French market research institute), consumers favor the use of multichannel, and that only 46% of retailers have a website. Also, know that 45% of them do not plan to start their online venture. This creates a gap among the behavior of modern consumers, being that 91% of those surveyed say they go online before they make purchases at the physical store. This gap goes even further, because even if a “brick & mortar” decided to develop its web channel, there are different ways to proceed. That’s where things get complicated. Only 18% of online retailers promote (SEO) while 75% of products are via a search engine. Although SEO is left behind, there are social networks that take advantage of the strength of its e-merchants by investing 37% of their time marketing on these platforms. One might think that it is relevant given the scale of Facebook, Twitter & co, but the reality is very different, as in fact only 9% of buyers consult social networks. Forums tend to generate the most excitement with 25% of consumers seeking advice, recommendations from peers, or opinion with respect to a product or service. Peer recommendations are becoming more important at the expense of sellers radius who see their skills challenged. In addition, consumers are looking for prescribers who have no financial incentive to recommend a product over another. Previously, merchants distinguished between physical and online business. But that time is over and it is important to consider these two channels for profit. Whether the Web to Store or the reverse (that is, Store to Web), this practice should be part of strategic thinking. Where should I sell? By which media are they attracted? Where should they be guided? Do I have a multi-channel inventory? Should we set up internet / store exclusives? The answers to these questions is up to you, and how you decide to achieve your goals! As for me, I will return to you shortly to address a different topic (but still related to e-commerce, of course). This entry was posted in E-commerce on July 9, 2015 by admin.